Over the last few years, the girls have really enjoyed making Rice Krispie bird nests for Easter and begged for us to do them again this year. However, a good friend posted the most adorable bunny-shaped cakes on Facebook, and I knew we should try something brand new this year. They turned out pretty cute, and a couple of people asked me to make a tutorial on how to make them. They are cute... they are bunnies... what's not to LOVE?! So the best part about these little guys is that you do not need a special pan, just a regular round pan. We ended up using store bought cake mix, store bought frosting, and strawberry jelly from the fridge for a filling. First cook two round cakes. It is easiest if you remove them from the pan while they are still warm. Spread a glob of jelly and spread around to almost the edges. Now we want to turn this cake up on it's end. I put a strip of wax paper under our first attempt, which turned out pretty tricky to pull out later on. I would recommend putting this half circle right on whatever you are going to serve it on and frost it from there. 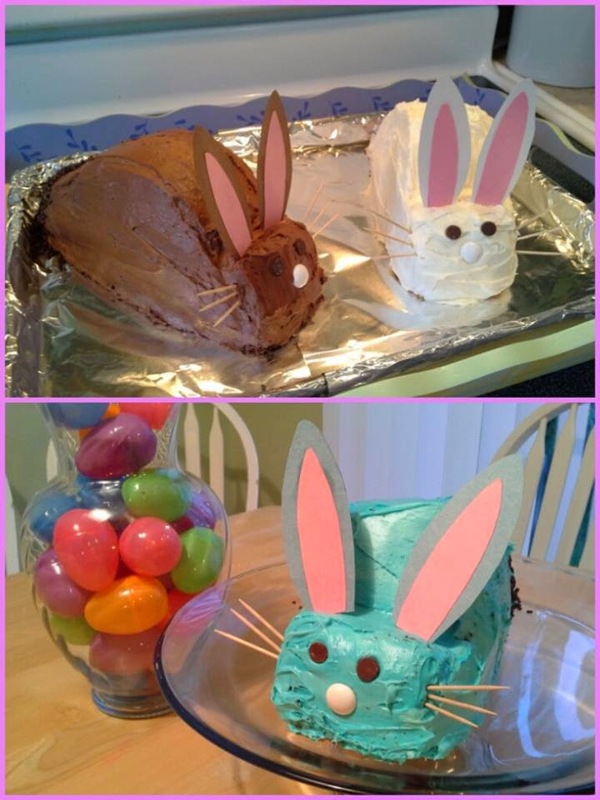 Now that the cake is up on it's side, we need to "carve" the bunny shape out. Starting a little past center, and with a sharp knife, carve down into the cake right where bunny ears might go. Leaving a section at the bottom to become the "face" of the bunny. Don't throw away the piece you cut away, flip it upside-down and place it at the back end of the bunny to create the "tail" area. Now comes the frosting. We were in a rush and just decided to use the store bought frosting from the can. This can be a bit messy as there really isn't a way to do an efficient "crumb coat". Because the cake is semi/frozen, frosting is a tiny bit easier. It's still akward though, just because the shape of the cake is so odd. Here's a good shot of the round parts of the cake on the outside, with the flat parts of both cakes on the inside. Reminds me of big giant hamburger. We got smart on the second one, and place the cut half right where we were going to serve it. I put small strips of wax paper underneath so we could frost without making a mess on the serving tray, and the small strips are easier to pull out after you are done frosting. Next we took the ears and taped them to the ends of toothpicks. We did this so paper would not be resting on frosting and soaking up moisture. This way the ears would last over night and survive travel time the next day to grandmas without getting mushy near the frosting. My daughter was the one that wanted to make a bunny face. She thought toothpicks would make great whiskers. We placed the ears above the head line, and they worked perfectly. We used two regular sized chocolate chips (with the tips pointing in) to make round bunny eyes, and we used a large candy corn flavored MnM (left over from Halloween) but any round candy will work for a nose. You could also use a pink jelly bean. After that we pulled out the wax paper from the bottom so our little blue bunny was sitting proudly on our cake plate. You can't see it, but we put rainbow sprinkles on the white bunny's tail, and we put chocolate jimmy sprinkles on the brown bunnies tail. All in all these were a big hit at the family Easter dinner the next day! These are so cute for Easter, but would be equally adorable at a bunny themed birthday party or ladies spring tea function. I also realized with just a few tweaks here and there, these could easily be converted into car or VW bug shaped cakes. Have fun cake carving, remember, if the cake is frozen, it will be a lot easier to cut and frost!